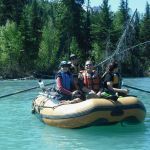 Alaska Downstream is a full service raft rental and statewide trip booking agency for all sizes of groups. Toll Free:(800)608-7238. We supply Interior Alaska with raft, cataraft, canoe, and kayak rentals. We are the largest rental company in Interior Alaska and have the largest retail selection, carrying Maravia, Soar, Mad River, Necky, Prijon, and Seward.